Overall, 2017 was a year to remember. To be able to work with clients who are enjoyable and motivated on a daily basis is a blessing. Oftentimes, I find myself driving home from a long day and wondering how I get paid to do what I do. That is in no way downgrading the service I provide, but to magnify the grateful feeling I have to work in a profession that is constantly evolving, active, and fulfilling. Several of my clients achieved big results this past year. Even though I’d love to take all the credit and say that it was the “perfect” program and what have you, I’d have to lean more towards them consistently putting in the effort, and that they were solely responsible for their success. Yes, I am the tour guide throughout all of this. I can show you how and where to spend your time/effort, but unless you actually do it on a regular basis it really doesn’t matter. And, on a regular basis I mean most days of the week for month after month. Fortunately, I changed my offerings from smaller commitments to, “If we are going to do this, you’ll need to invest the next 6-months,” kind of thing. That’s because many of us possess the mindset that a few weeks or a single month is enough. To be honest, that’s barely scratching the surface. So, if there’s one piece of advice I can give you looking ahead to 2018, it’s be consistent for the long haul and you will undoubtedly be rewarded. As I work with more and more endurance athletes, the need to train to exhaustion drastically reduces. This approach is fine for the general population, but when it comes to athletes who consistently and progressively stress the body, overuse is quick to follow. That is why I often find some group exercise classes can be more detrimental than helpful for runners. Instead, it’s important to be respectful of your mileage and add just enough of a stimulus to see improvement. Anything more than the minimum effective dose is a step closer to overtraining. With this approach, a lot of education is often needed to teach and get buy-in for this concept. Quality of movement must be held to a higher regard than quantity. Endurance athletes are already getting quantity within their training plan, so let’s emphasize good movement to stay healthy and pain-free. I often compare this concept to taking painkillers. If one Advil eliminates your symptoms, do you necessarily need two? Let’s apply that same thought process to functional training for endurance athletes and I think you will be surprised with the positive results. Foam rolling and other forms of self-myofascial release (SMR) have become more of an afterthought in many of my programs this past year. Even though research does indicate there are some positives to SMR, it seems like we have been placing it on a pedestal that is far too high. Does it break up scar tissue? Probably not. Does it re-align muscle fibers? Doubtful. But, it does create a reflexive response from the nervous system to down-regulate or temporarily reduce tone in a tissue. This means we can take advantage of it’s short-term benefit and use SMR to facilitate better flexibility, movement, and recovery. However, alone it’s long-term benefits are very few and far between. Instead of rolling around and hoping for the best, how about teaching your body how to get into certain positions with better awareness and control. Your hamstrings are tight? You may be more quickly rewarded by addressing mobility and movements that lengthen the hamstring throughout the full range of motion. This approach has been more productive and creates sustainable, long-term results. Ultimately, what we have to realize that there is more to range of motion that just one specific muscle that appears to be tight. I know your hamstrings always feel like they limit motion and are achey. But, is that due to poor gluteal firing, inability to appreciate end-range of motion so the hamstrings are protecting, or lack of stability elsewhere? All of the above mentioned issues will NOT be corrected with the foam roller. Yes, a foam roller may allow you to temporarily feel less tight. However, it will not correct the underlying issue when completed in isolation. What I’m trying to get at is you must incorporate daily doses of good quality of movement. Stop rolling around on a foam roller or trigger point ball for 10, 20, or 30-minutes and start teaching your body how to get in the right positions. We are so efficient as humans that I’m confident this approach will provide you better long-term and more sustainable results. The dynamic warm-up is a topic that I’ve held several seminars on this past year. It was also something that I devoted plenty of content to on social media. To say I love this topic is an understatement. The problem is, we often take warming up too literally. Yes, increasing tissue temperature and lubricating the joints is important before a workout or run. But, there are so many other aspects of a good dynamic warm-up that go overlooked. Let’s put the term ‘dynamic warm-up’ on the back burner for just one second… How about we call anything we do before running and exercise ‘movement preparation.’ Movement prep is a term that is more synonymous with quality and function, than solely tissue and body temperature. Movement preparation can include strategies, such as: foam rolling and self-myofascial release, flexibility and mobility drills, balance and stability exercises, full range of motion movements, power and plyometrics, and locomotion. All of these should be targeted at the specific areas your body needs addressed to move more efficiently, prepare for the activity that is soon to follow, and “warm-up” the body. This is why I feel replacing the dynamic warm-up with a movement preparation routine would greatly impact you moving forward. Let’s stop using a general approach and hoping for individual benefits. Instead, learn which areas of your body need to be targeted in order to become a A+ mover. Then, hammer down day after day before each activity to address these. I think you’ll notice that movement quality improves, your workout and runs become more effortless, and automatically you end up “warm” and ready to rock and roll. Who would’ve thought?!? When you are hungry to learn, surround yourself with really smart people. 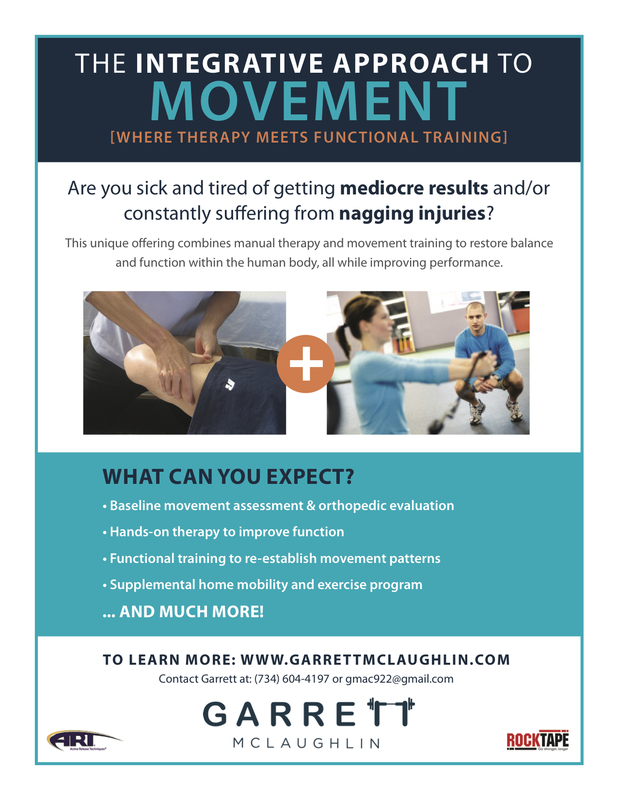 This past year, I was fortunate enough to team up wth local physical therapist, Chris Wolfe, on various seminars and smaller pieces of educational content. To say the only thing I learned was this small tweak on the traditional step up would be an understatement. It’s one of those exercises that I’ve been programming for years with success, and his small adjustment made it even more valuable. Because I deal with a lot of runners, single leg stability is at the forefront of what we focus on. That means the step up is a perfect exercise choice to impact this. For years, I have taught a more upright position on the step up which doesn’t necessarily provide as much control on the descent. After learning from Chris, if you reinforce a more hip-dominant position and forward lean, the ability for the hip to control the descent drastically increases. This can be good for some people and VERY challenging for others who lack the control and appreciation of getting the hips involved. In the end, it allows a more hip-focused, eccentric control during a fantastic single leg movement. This is something everyone, especially runners, can benefit from. Regressions are such a valuable part of any exercise and rehabilitation program. That’s because you don’t always progress in a linear fashion. Whether that be due to pain or poor movement, there’s a time and place for plan B. Years ago I was very particular about my programming because I liked to sequence exercises a certain way. With this approach you’ll quickly realize that there are some people who just don’t progress the same as others, and you may need to make additional modifications. There is no need to be embarrassed or discouraged by this. To be completely honest, I’ve had to regress more exercises than I can remember this past year due to knee pain. Let’s think about this scenario because we’ve all been there… Know when you are driving in a new neighborhood and you have your GPS set to find your destination? Well, there are times when you are either not paying attention and miss your turn or the sound on the GPS is turned off and you drive right past the street. The GPS re-calculates the route and finds you an alternative way to get there. Yes, this might take you a few more minutes and cause you to drive a more scenic route. But, it’s just a small modification to the original plan that ultimately provides you the same end result. This is how I feel about regressions. Even though I’m trying to get you to achieve your goal is the shortest and safest time frame possible. There comes a time and place when we have to detour. Our eyes are still set on the end-goal, but our path is no longer linear. Don’t get frustrated when you have to detour along the way. Movement is often complicated with many detours and additional turns. It’s those people who accept the alternate route with an open mind and respect the process who quickly find themselves back on track and potentially better than before. This is exactly what happened to me… I was frustrated at a recent flare up in my right knee that I pretty much threw in the towel. Why exercise if I can’t do what I wanted? If you know me you know I can be stubborn like that. Instead I went back to the drawing board. I know I couldn’t do any lunges or split squats so I opted for a sumo squat. What happened? Doing this for 6-8 weeks put my knee in a very low stress position that didn’t cause pain. I was still able to work towards my health and fitness goals while minimizing stress on the knee. With patience and consistency I soon found that I gained more options. Now pain was minimal/non-existent with split squats so I started with light weight and worked up. This was the trend that I followed throughout the entire year. Fast forward a year later and I have no limitations, very minimal knee pain, and have actually made tremendous improvements in my health/fitness. With that being said, I highly recommend you put your ego aside from time to time and be open to taking a step back. It may not be the fastest route but if you keep your eyes on the end goal there are other ways to get there. The GPS, despite frustrating at times, always gets you to your end destination. I mentioned before that I was stubborn, right? For years, I have been working, and very motivated to improve myself and my business. As we all know, that can be very challenging when you have no business background. I mean, I went to school to help people, NOT for marketing, sales, and other administrative tasks. And the best part is, I preach on a daily basis that if you need help with your fitness, an injury, or anything movement-related that I am your guy. Then why did it take me so long to accept my own advice and find someone who was more qualified to save me time, money, and energy? In October of 2017, I hired a business coach. My goal was to simplify my processes to only the most reliable and least time consuming that provide results. I know it’s only been 2+ months now, but having someone to help me along the way has been tremendous. Instead of getting opinions from friends and loved ones on what they “think” might be a good idea. I have the backing from a business owner who has been through all of this herself and has the resources to facilitate long-term and sustainable growth. What I’m trying to get at is, it’s time to take a honest look at yourself in the mirror. Has it been months, years, or decades that you have been struggling to see the results you deserve? Start to realize that you are great at some things but not everything, and that’s okay. That’s why I recommend putting your ego aside and asking for help in those areas where you struggle. Ultimately, you are making the best investment of all time. The investment in YOU. Thank you for taking the time to read this article. I would love to hear what key things you learned this past year. And, I wish you nothing less than HUGE results in 2018. If there is anything I can do to help you see faster and more reliable results with your health/fitness, please click the link below to schedule your FREE 30-minute Success Session.